Jumpin’ Jack makes an appearance at Milwaukee Harbor Festival where Asian carp tacos were on the menu. In the past few months, Illinois-Indiana Sea Grant (IISG) educators rocked out with new partners to raise awareness about the threat of Asian carp. 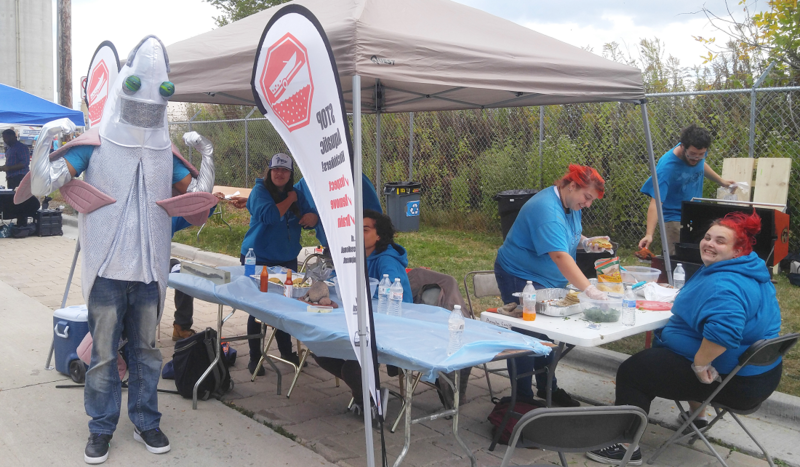 Jumpin’ Jack, IISG’s costumed silver carp sensation, was on tour at several large public venues in Milwaukee, and Education Coordinator Terri Hallesy made an appearance at Water Palooza in Chicago. Jumpin’ Jack’s stops in Milwaukee were part of IISG’s new partnership with the Great Lakes Community Conservation Corp (Great Lakes CCC). This group is focused on training and educating disadvantaged populations in the Greater Milwaukee region, including about environmental issues. The group introduced the bedazzled Jumpin’ Jack at a tailgate party before a Brewers-Cubs game and at the Milwaukee Harbor Festival. At both events, the Great Lakes CCC brought visitors to their booth through the costumed character as well as with cuisine, demonstrating the value of cooking these fishes. Asian carp sliders were on the menu at the tailgate party and tacos at the harbor festival. “We ran out well before the event was over, serving 350 Asian carp tacos,” said Chris Litzau, Great Lakes CCC president. While tacos were served, Jumpin Jack posed for photos and danced for the crowd. Visitors to the booth also learned about the threat and impact of aquatic invasive species to Great Lakes and other waters. Asian carp are prevalent in the Illinois River, with an electric barrier in the Chicago Sanitary and Ship Canal deterring them from entering Lake Michigan. Researchers and resource managers are concerned that these large fish could have devastating impact on the Great Lakes food chain. 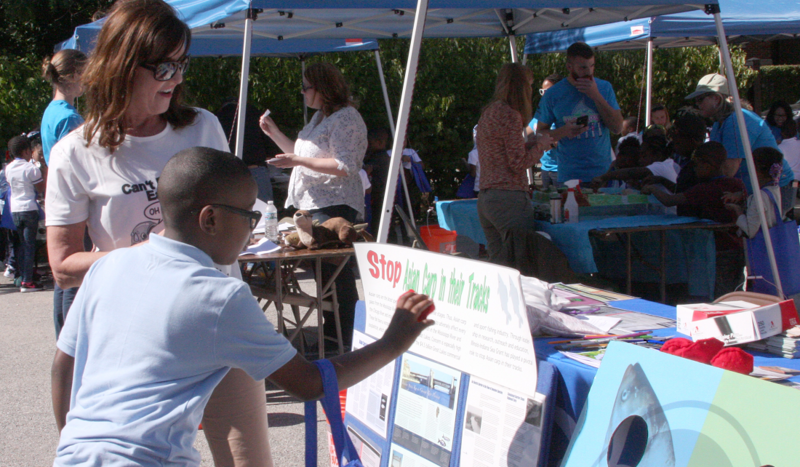 IISG Education Coordinator Terri Hallesy helps a Manierre Elementary School student stop Asian carp in their tracks. Like its more-crowded namesake, Water Palooza is an outdoor event geared towards young people—but in this case, elementary school children. This one-day event is organized by the Water Environment Federation’s Student and Young Professionals Committee. 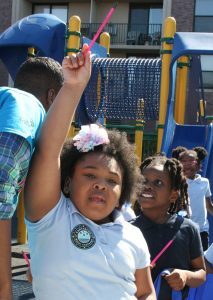 This year it was held on September 29 at Manierre Elementary School in Chicago. Free pencils at Water Palooza help make it a great day. At Water Palooza, students take part in hands‐on activities that help them learn the value of water and encourage them to care about water in their world. 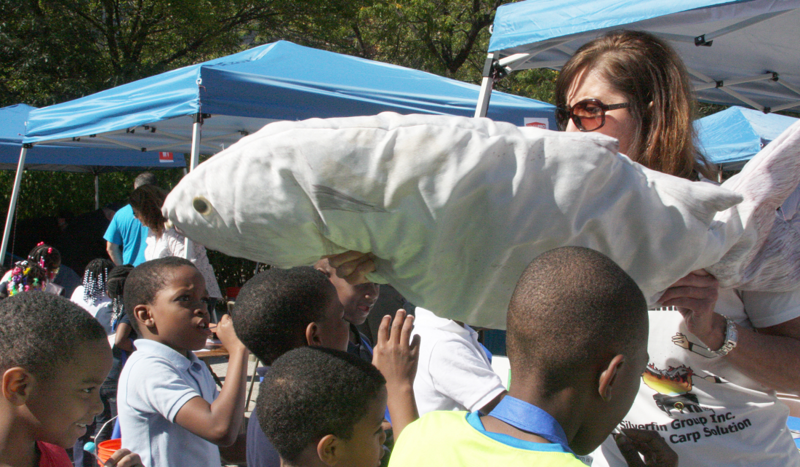 This year, IISG joined in the festivities with a stuffed animal Asian carp, a Stop the Carp in Their Tracks beanbag tossing game, and other aquatic invasive species-related activities.